The story of Pavel Zacha is very famous in Europe. Before he was even born, his father decided to make him a star in the NHL one day; so he left his regular job and became his son's coach since Day 1. Years later, he even wrote a book about this rare hockey career, and we have to say there will be more books and TV shows about this in the future. Pavel is considered to be the biggest star of Czech hockey in the past ten years. He is ranked in the top 10 for the upcoming NHL draft. Colorado Avalanche will pick their first player of the draft from the 10th overall place. Zacha played most of his junior and senior career in the small town of Liberec, north of Prague. Two years ago, he played his first game for a senior team in a top league and scored in his first game ever at the professional level during his first shift ever after just 44 seconds. Besides his unreal performance in the Czech hockey league, he played for the Czech national team at every youth and junior level. He was drafted first overall in the CHL's draft by the Sarnia Sting, where he played 37 games and recorded 34 points last season. 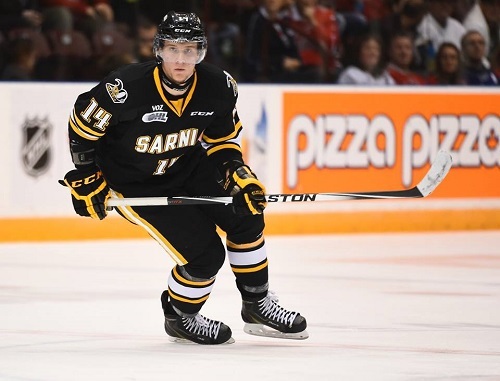 He was named to the First OHL Rookie All-Star Team and also won a silver medal at World Championship under 18. 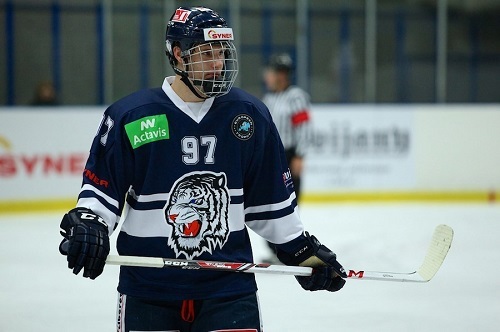 Zacha's profile on eliteprospects.com: Pavel Zacha is an offensively dynamic center with size, speed, and skill to make a significant impact on the game. He can play physical, but is at his best when using his high-end offensive abilities, such as his shot, stickhandling, and footspeed, to generate numbers in the opposition's end of the ice. All-in-all, Zacha is a lethal weapon that can be depended upon to create, and finish, dangerous scoring chances whenever he is on the ice. Zacha will fly to Buffalo this week to participate at the NHL Combine – an event for the top 120 draft-eligible players that includes physical testing and interviews with representatives of NHL organizations. There is a big chance you will be drafted in the top 10 this year. Did you see a list of team that could potentially draft you? Do you have any favorites amongst them? I checked teams that will pick players between the 5th and 12th place. There are teams I would like to play for. It doesn't matter at which place they will pick me. There are some super teams like for example New Jersey, Philadelphia, Colorado or San Jose. Great cities, great organizations. It is hard to choose anything specific. I would be happy, if some of these teams picked me. Are you ready to play in the NHL in your first year? I have been working hard for this for 18 years. Of course, it's very hard. We will see at the camp if I can make it. I can't say it right now, because I have never been at an NHL camp before. Of course I want to show them I can do that. Hopefully I will be able to be there right during the first year. Have you talked with anybody from the Colorado Avalanche organization yet? Not directly. They talked about me with my agent and he told me they had big interest in me. They haven't come to meet me yet, because we will see each other at the NHL combine. I'm supposed to have dinner with them there. My agent told me they were talking a lot about me. 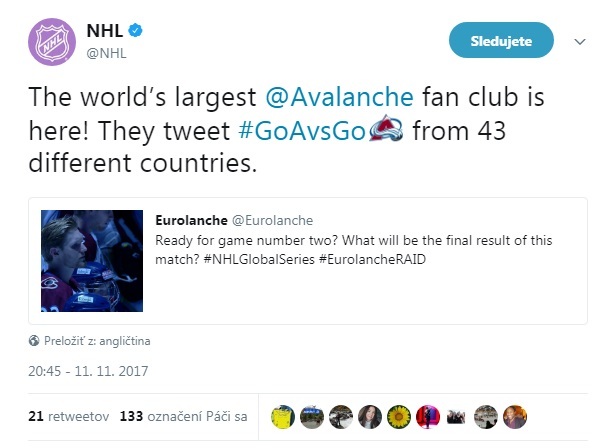 Could we say that the Avalanche have the biggest interest in you, or are other teams very intrested as well? I can't say that all teams have such a big interest, because they may tell every player that they are best for them. I am happy when teams want me. Talking about Colorado, it sounded like they have a really big interest in me. I'm yet to speak with them, however. We will see what happens at the combine. Do you know any Avalanche players? Personally not, but, for example, I know MacKinnon's former linemate from Halifax – Drouin. I know that there's coach Patrick Roy, great goalie. They have great management, Sakic. Hejda, Duchene, Landeskog play there. It's a pitty they traded Stastny. Did you have any favorite NHL team and player? It has changed a couple of times. I liked Washington, because Ovechkin played good. But I liked Colorado, too, when Hejduk was the leading goal-scorer in the NHL. Be sure to visit Zacha's official website managed by his father at Zacha-hokej.cz.